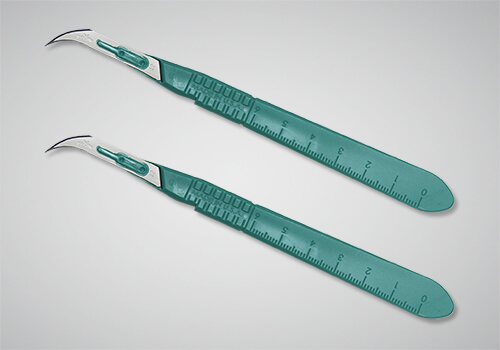 Sterile disposable scalpels with a stainless steel blade. Designed to minimize the risk of surgical blade injuries. 10 per box. Aspen Surgical was formerly Bard Parker. *Price per 10 per box. Surgical blades. Single-use blades in individual foil packs. Consistent sharpness, control and strength surgeons demand. 50 per box. Aspen Surgical was formerly Bard Parker. Best Selling Surgical Blades. Highest quality surgical steel. 100 blades per box. DemeTech's Chromic Catgut suture is an absorbable, sterile, surgical suture composed of highly purified connective tissue (mostly collagen) derived from either beef or sheep intestines. 12 per box. DemeTECH PGA Coated Sutures are Polyglycolic Acid suture is a synthetic, absorbable, sterile, surgical suture composed of 100% glycolide. The chemical formula of Deme Tech's PGA is (C2H2O2)n. 12 per box. DemeTech's Plain Catgut suture is an absorbable, sterile, surgical suture composed of highly purified connective tissue (mostly collagen) derived from either beef or sheep intestines. 12 per box. DemeTech's Silk suture is a non-absorbable, sterile, surgical suture composed of an organic protein called fibroin. Deme Tech's silk sutures are processed to remove the natural waxes and gums from its origin. 12 per box. Ethicon Ethilon nylon sutures. A nonabsorbable, sterile, surgical, monofilament suture composed of the long-chain, aliphatic polymers Nylon 6 and Nylon 6.6. Ethicon Monocryl sutures. Undyed monofilament. Indicated for use in general soft tissue approximation and/or ligation, but not for use in cardiovascular or neurological tissues, microsurgery, or ophthalmic surgery. 12 per box. Surgifoam. Box of 24 absorbable gelatin sponges. Ethicon coated vicryl sutures. Sutures are undyed, braided and 18” long. Made of strong, sharp micrograin stainless steel, an exclusive Ethicon process yields the ideal balance between ductility and resistance to bending.12 per box. Foundation is a bone augmentation material for use after teeth extractions. Collagen-based, it provides support for implants, bridges, and dentures. Immediately following an extraction. Foundation is shaped in “bullet” form for easy placement. Look brand premium gut sutures. 12 per box. Resorbable collagen membrane made from bovine material. Compatible with RTR bone regeneration product. Provides easy adaptation to the site and is tear resistant. Can be cut to size if needed. RTR is a pure synthetic bone grafting material that helps to safely promote new bone formation following an extraction. 1 x 0.8cc syringe.